Apple Chief Executive Officer Tim Cook - the man in charge of a company that brought in over $8 billion in profit last fiscal quarter - isn't worried about a stream of new products "cannibalizing" one another. His main focus is taking on the world of PCs, and perhaps one slate in particular. 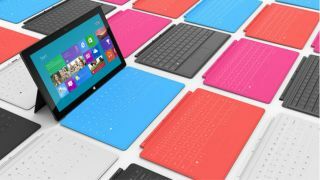 When asked to comment on the impending launch of Windows 8 and Surface RT tablet, both by Microsoft, during an investor call Thursday, Cook said he hasn't spent any time with the Softies' tab. That did not, however, keep him from commenting on it. "What we're reading about it is it's a fairly compromised, confusing product," Cook said, immediately setting Apple's tablet line apart from the new offering. "One of the toughest things you do is make hard tradeoffs and decide what a product should be, and we've done that with the iPad." Cook and company are clearly locking their sights on making the PC market grovel by offering devices that work in tandem with each other, not against. Responding to another investor query, he said new slates like the iPad mini and iPad 4 aren't destined to cannibalize one another or other products. What's more, he has faith customers can choose between the mini, fourth-generation iPad, iPad 2 and products like the iPod touch - or buy all four. The real decision, he said, comes down to picking between an iDevice and a PC. "We've learned not to worry about cannibalizations," Cook said. "The far bigger opportunity [is] the 80-90 million PCs sold every quarter. "I think a great number of those people would be much better off buying an iPod or a Mac. There's a much bigger opportunity there for us than people buying a PC."